While unmounted, the encrypted folders are invisible to the user. While mounted, you need to enter the password to access its contents. 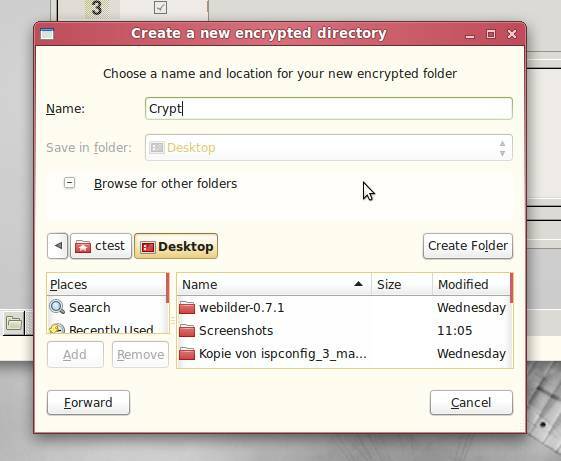 To create a new encrypted folder just click on the key icon on the system panel and select New encrypted folder. Make sure to unmount the encrypted folders before you quit Cryptkeeper since the files become accessible if they are mounted and Cryptkeeper is inactive. The files remain invisible if they are unmounted and Cryptkeeper is quit. Thanks, info on whether this is a native program or third party program and its download location would help. so it will be available via Your favourite package manager (apt, aptitude, Synaptic or what do You prefer). Which is default place to search programs in Ubuntu. But it will not work correctly in newest Ubuntu on default settings — looks to need GNOME to be usable.